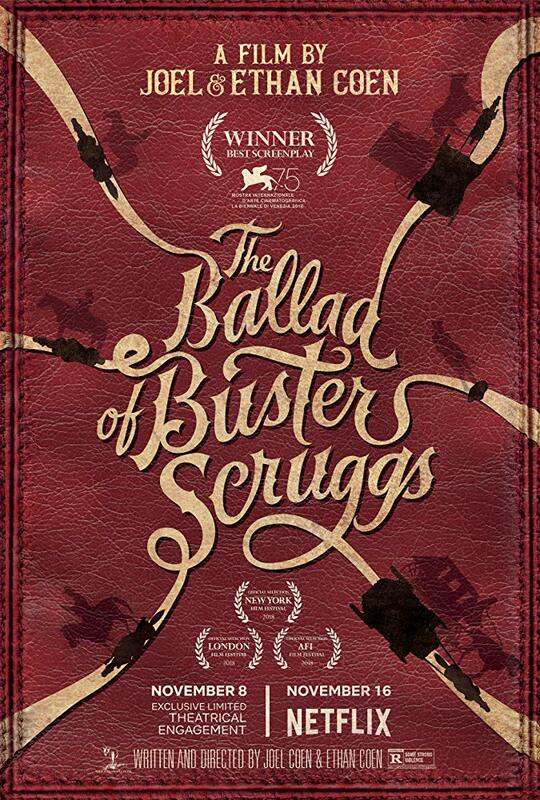 While Sharon was having dinner with Tom on Saturday night, I watched The Ballad of Buster Scruggs. This is a 2018 American western anthology film written, directed, and produced by the Coen brothers. The film features six vignettes that take place on the American frontier. The film was based on Western-themed short stories which were written by the Coens over a period of 20 to 25 years that differ in mood and subject. Two stories--All Gold Canyon and The Girl That Got Rattled--are based on previously published short stories. The stories are by Jack London and Stewart Edward White, respectively. 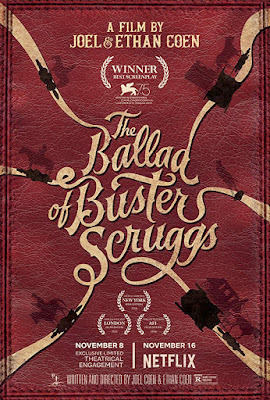 Like Roma, The Ballad of Buster Scrugges had a limited theatrical run beginning on November 9, 2018. It was then released on Netflix on November 16. The National Board of Review named it as one of its top ten best films of 2018. The film earned three nominations at the 91st Academy Awards: Best Adapted Screenplay, Best Costume Design and Best Original Song ("When a Cowboy Trades His Spurs for Wings"). I watched the film because it had been nominated for Best Adapted Screenplay. I didn't enjoy it; I don't recommend it. I found the film slow in parts and just too morbid. This is just not my sense of humor. Reading a couple of articles about the film after the fact, I probably missed some of the finer points of the Coen humor and story telling. I will admit that the Western scenery is gorgeous.